Home Cloud Insights Virtualization Or Cloud? 5 Questions To Help You Decide. Virtualization Or Cloud? 5 Questions To Help You Decide. I’m a virtualization architect so I spend a considerable amount of time talking with customers about their computing requirements. Nearly every conversation includes discussion about when to choose virtualization and when to move to cloud computing. There is little doubt that virtualization is the foundation for cloud. Pooling and abstraction enable IT teams to optimize resources and hide the complexity of underlying hardware or software. Through automation, virtualization allows different operating systems (OSes) to share the same hardware and simplifies moving OSes between different hardware while applications are running. Yet just because virtualization is widely accepted as the foundation for cloud, it doesn’t mean that every IT team needs to embrace a cloud model. Case in point: I worked in IT for a large grocery retailer. We wanted the flexibility and cost savings of server virtualization but our environment went relatively unchanged for months at a time. Our demand load was fairly consistent so we didn’t need to ramp up for any peak periods and we didn’t have requirements to quickly spin up lots of on-demand dev/test sandboxes. Although we continued to evaluate the pros and cons of moving to the cloud, virtualization was perfectly suited to meet our business needs. Speed – What is your expectation of provisioning times for virtual machines (VMs)? 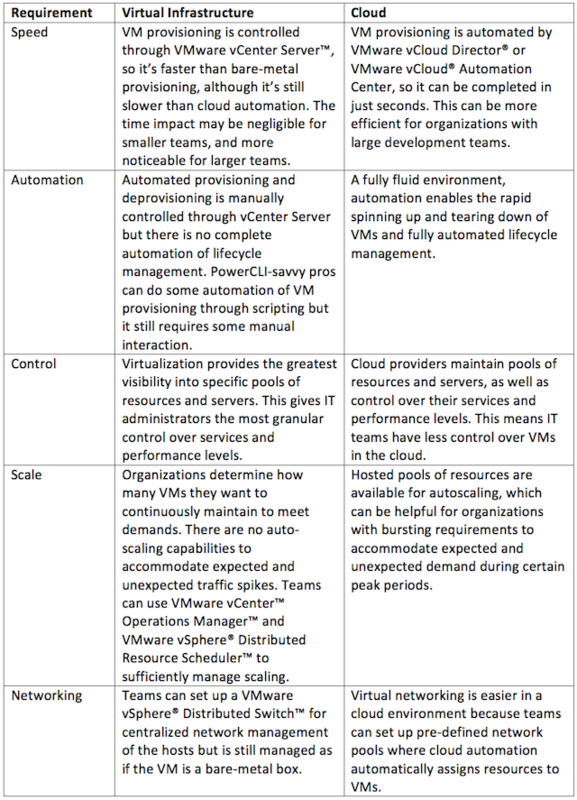 Automation – How automated do you want your provisioning and deprovisioning of VMs to be? Control – Do you want to enable on-demand access so end users (i.e., developers) can manage their own environments or do you prefer that system administrators keep control? Scale – Do you have a need to auto-scale your environment? Networking – Do you expect to move to virtual networking? The answers to these questions can make it easier for IT teams considering the move from virtualization to increasing levels of self-service. Many IT teams know Rackspace because of OpenStack, the open and scalable OS we invented with NASA for building public and private clouds. What you might not know is that we are also experts in VMware virtualization. Rackspace has more than 43,000 VMs under management. That’s more than any other VMware partner. Our experts help IT teams like yours manage hosts and rules to decrease costs while increasing the efficiency of any computing environment. 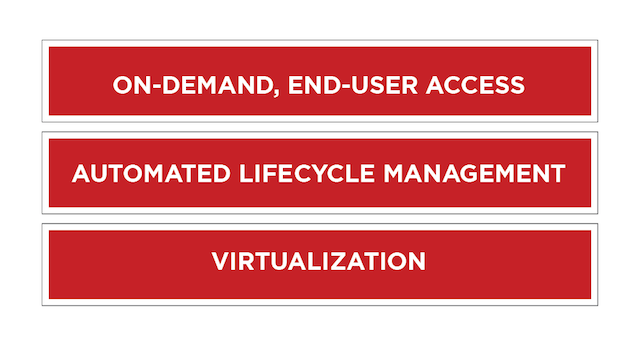 Your IT organization can choose to let us fully support your VMs using Rackspace’s Managed Virtualization Service or you can stay in control with Rackspace’s Dedicated VMware® vCenter Server™ offering. In both cases, we provide Fanatical Support® while offloading and automating time-consuming and manual processes so your team can focus on more strategic efforts. If your team is trying to decide between virtualization and moving to the cloud, think about your requirements, then drop me an email. Let’s discuss the options.